Today we’ll take a look at the three most common injuries that result in workers’ compensation claims and how you can prevent these from occurring. Not only will preventing injuries boost your insurance rating and decrease your premiums, but, more importantly, you’ll improve morale by demonstrating that you care about keeping your employees safe. 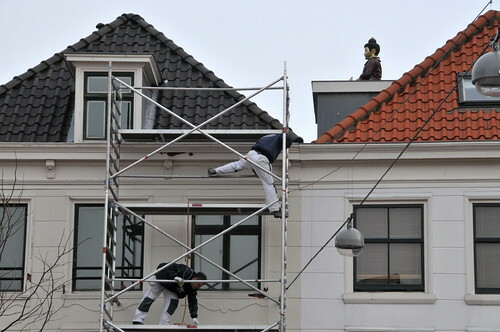 Falls are the most common on-the-job injury for any industry, but are especially a concern for commercial painters that are frequently atop ladders, scaffolds or working at elevations. 30-40 professional painters die each year in falls at work and another 40-50 are injured so seriously in falls that they have to miss work for a few days, weeks or months while recuperating. Preventing falls: OSHA has developed a fall safety and prevention program that’s well worth checking out. It’s based on three tiers – plan, provide and train. The first step is to plan the job out ahead of time so that the safety of your workers is accounted for. Secondly, provide the proper equipment, including sturdy ladders, scaffolds and, for those working at greater heights, personal fall arrest systems (PFAS) complete with harnesses and anchors. Finally, you must train everyone in how to recognize hazards and properly use ladders, scaffolds and safety equipment. We’re not referring to coughs and flu here, but illnesses caused by contaminants on the job. Stripping chemicals, paints and solvents that are required to do your job produce fumes and these can lead to irritation of the nose, lungs and throat if inhaled. Chemicals themselves can produce irritation and burns if they come into contact with skin or eyes. Lead-based paint in older worksites and asbestos also pose serious health risks that can produce serious, long-lasting and even terminal illnesses. Preventing chemical irritants: As with falls, this comes down to planning, education and equipment. Researching the construction and history of the facility or residence you’re working in will alert you to the possible presence of asbestos or lead-based paint so you can implement preventative measures to protect workers. Be sure to review material data safety sheets on all products you use so that you’re aware of risks from products and the recommended treatment if ill-advised contact or exposure occurs. Be sure to follow product guidelines on ventilation, hand and eye covers and masks or respirators, and ensure your workers comply with these safety measures. Roughly 60% of on-the-job injuries are repetitive stress injuries meaning that repeated actions damage muscles, nerves, tendons or ligaments over time. This is a serious concern for commercial painters because repetitive motion is your bread and butter. Over time, the sweeping side to side motion used with sprayers or the up and down movements with paint rollers to get uniform coverage can harm you. These can result in musco-skeletal and nerve problems that can range from mild pain to debilitating permanent injury. Preventing repetitive motion injuries: When working with your head and neck at odd angles (like when painting ceilings) or during repetitive motions of any sort, studies show that frequent, short breaks are important to prevent injury. When taking a breather, you should flex the muscle or body part that’s been extended to stimulate circulation and allow your muscles and nerves a moment to recover back to stasis. It may be too much to monitor individual workers to ensure they’re taking a stretch once every half hour, so employing a site-wide stretch break may be better. Blow a whistle or sound a bell to signal a three minute stretch and enforce it. This will keep your workers safer and your premiums down. Establishing injury prevention education and training programs is good business – for both you and your workers. They want to be healthy and fit to work and earn a wage, and you don’t want to lose valuable employees to accidents and injuries. This is a win-win and none of these strategies should be costly to implement and will, in fact, save you more in the long run.